I started The Kingdom of Malinas when I was seventeen and self-published it several years later in 2008. The second book in the trilogy, The Empress Graves, needed a rewrite and a whole sub-plot adding before it could be published on my birthday in 2010. 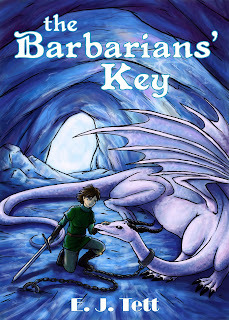 The third and final book in The Power of Malinas trilogy, The Barbarians' Key, has now finally been written. I started it years ago, after finishing the first draft of the second book, but I only got to chapter sixteen before I went on to do other things. I picked it up after completing The Empress Graves and worked hard trying to remember what I had intended the resolution of the series to be! Luckily, I kept notes, so I looked through those - keeping some ideas, abandoning others, even deciding not to add in two new characters I'd created. The plot is far more complex than in the other two books, there is more happening and the action takes place throughout the country of Aldenland. I have been through my first draft, tweaking and editing and correcting mistakes, and now the book is with a lovely beta reader who will let me know exactly which bits work and which don't. I will then work on it again. And soon, I hope, I will release it on Lulu. Congrats, and best of luck with it. The cover looks nice. Is it aimed at a young adult audience? [I think I remember you saying somewhere or other that was your audience]. Yay! I am so looking forward to reading it! Ta! Thad, yep, young adults.